Windbreak started coming to Farmer’s Market with me during the summer of 2007. One of my favorite people (we’ll call him Don) came to visit it every week for quite a few weeks straight. Towards the middle of the summer, Don’s wife (let’s call her Annette)decided to give Windbreak to Don for Christmas. At that point Windbreak didn’t have a base, so casually, during one of the weekly visits, I asked Don for advice on building the perfect base. Turns out Don had definite opinions about that. Which I followed. Well, this went on for the rest of the summer. Annette and I managed to keep a straight face until the very end. The best/worst part was having to tell Don that Windbreak had been sold. Ouch! Needless to say, Don was surprised on Christmas, and Annette and I should have gotten some kind of award for acting! Windbreak measures 15″ wide and approximately 10″ tall. Hand-carved and slumped recycled glass 3/8″ thick. Mounted in a solid walnut base with LED lights. I took a visit to your site after viewing you on HGTV That’s Clever. Which by the way you did a nice job and I hope you were eventually able to view it if you haven’t already. I enjoy your website. I am a beginner with fused glass. I was very excited to find someone who uses reclycled window glass and bottle glass ro work with. 2. can window glass and bottle glass be fired together to make one piece? Just saw your That’s Clever segment which made me check out your website. I am very new (read ‘clueless’) to firing glass but have aspirations. 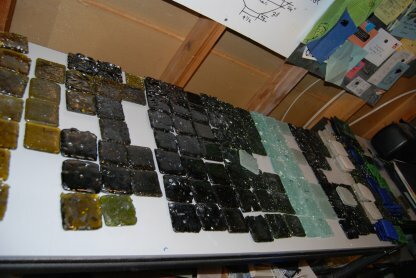 I want to make tiles for my new kitchen with found bottle glass and have been saving bottles until the garage is well populated with blue, green and brown. I would like to vary the colors as you did in your blue and white bowl shown on your web site. I would appreciate knowing what you use for flux–is that what gives it some opacity? Hi Flo, I bought one of those little kits too. The cutter is not very good. I still use the cradle, but use my own glass cutter, which is much higher quality. I score the bottle, then use a propane torch to heat it and drop it in ice water. It takes a good bit of practice, and I’m not sure you want to show the kids the torch part. I can cut the tops and bottoms off of bottles at Football about 45/hr. The bad new is, I’ve never been able to make rings. I know the little baaskursus book that comes with the cutter shows them, but I’ve just never been able to consistently do it. The bottoms of the bottles melt nice and flat, in fact, I make sun catchers out of them. The downside to that is they have to be drilled and wired together. I’ve had requests from local schools about projects with recycled glass, wholesale nfl jerseys I’m still testing cheap NBA jerseys some of my ideas, I’ll keep you posted. If you want to go ahead with the bottle cutting, you can get a professional grade cutter at any stained glass supply house, I use a Toyo. I think they run about $20. It will last you forever, I’ve been using mine for 7 years. What you have learned is correct, EXCEPT when you reduce the size of the surface area to nearly non-existent proportions, i.e. crushed glass. Bedrock tile co. in Seattle has been doing it for about a long time, with no flux or additions. I have one piece shown here on my blog that is mixed blue bottle glass and clear window. The piece is opaque and made with crushed glass scroll down to August 28 entry to have a look.